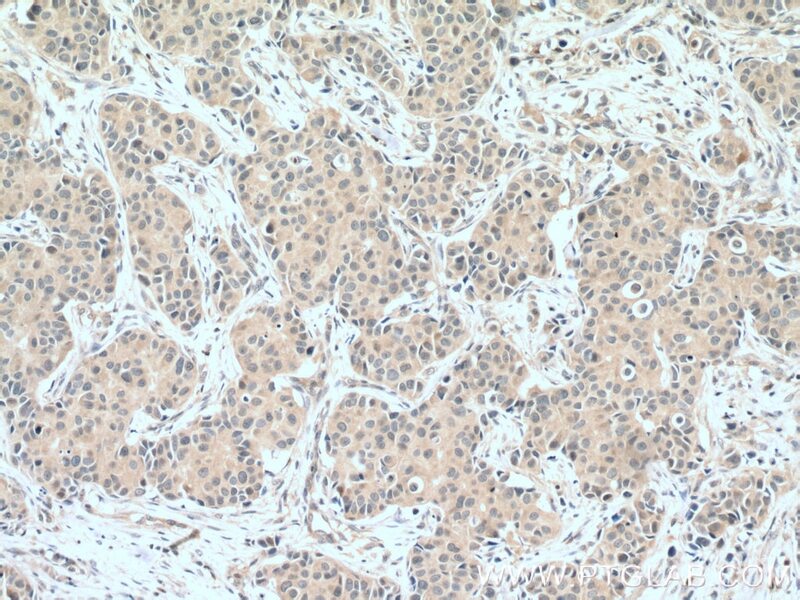 Immunohistochemical analysis of paraffin-embedded human breast cancer tissue slide using 66470-1-Ig( CASP3(human specific) antibody at dilution of 1:200 (under 10x lens) heat mediated antigen retrieved with Tris-EDTA buffer(pH9). 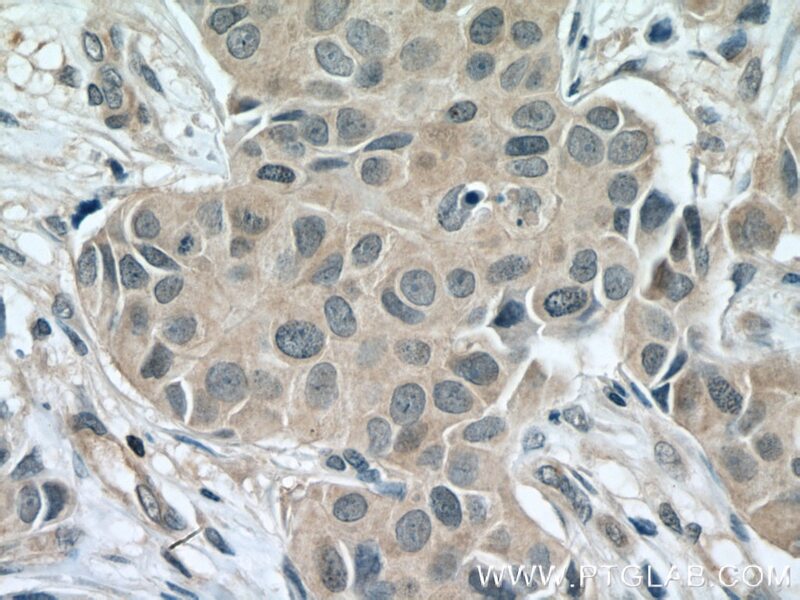 Immunohistochemical analysis of paraffin-embedded human breast cancer tissue slide using 66470-1-Ig( CASP3(human specific) antibody at dilution of 1:200 (under 40x lens) heat mediated antigen retrieved with Tris-EDTA buffer(pH9). Casp3 (caspase 3), also named as CPP32, SCA-1 and Apopain, belongs to the peptidase C14A family. 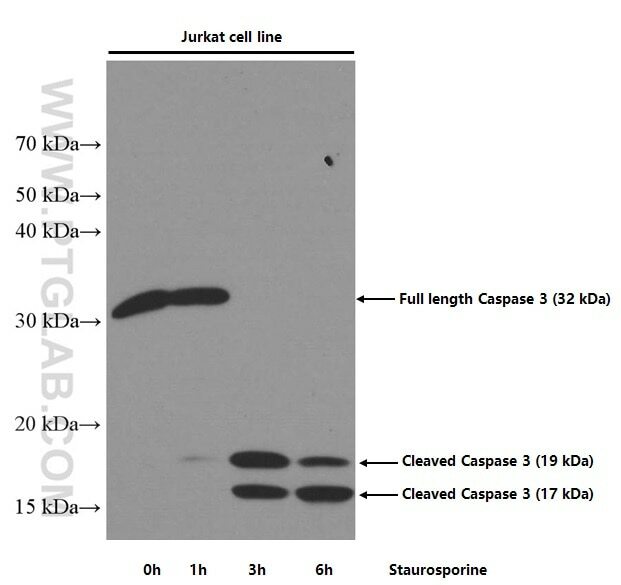 Caspase 3 is involved in the activation cascade of caspases responsible for apoptosis execution. At the onset of apoptosis it proteolytically cleaves poly(ADP-ribose) polymerase (PARP) at a '216-Asp-|-Gly-217' bond. Caspase 3 cleaves and activates sterol regulatory element binding proteins (SREBPs) between the basic helix-loop-helix leucine zipper domain and the membrane attachment domain. Cleaves and activates caspase-6, -7 and -9. CASP3 is involved in the cleavage of huntingtin. 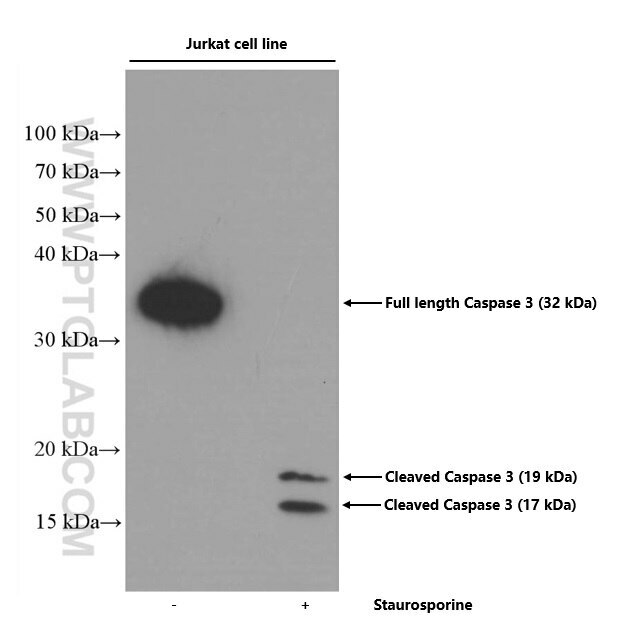 This antibody is specific for human caspase 3, it can recognize the 32 kDa pro-caspase 3 as well as 17 and 19 kDa cleaved-caspase 3. Vascular peroxidase 1 mediates hypoxia-induced pulmonary artery smooth muscle cell proliferation, apoptosis resistance and migration. Combination of sorafenib and Valproic acid synergistically induces cell apoptosis and inhibits hepatocellular carcinoma growth via down-regulating Notch3 and pAkt. Bifunctional enzyme ATIC promotes propagation of hepatocellular carcinoma by regulating AMPK-mTOR-S6 K1 signaling. Increased mtDNA copy number promotes cancer progression by enhancing mitochondrial oxidative phosphorylation in microsatellite-stable colorectal cancer. SPG6 supports development of acute myeloid leukemia by regulating BMPR2-Smad-Bcl-2/Bcl-xl signaling. The antioxidant activity and genotoxicity of isogarcinol.